With e-commerce being the foundation of all successful business in the modern world, you need to be tactical in developing your websites. Photography is beyond outdoor duties and the biggest favor you can do to your photography profession is to use Video Blog Website Templates. Apart from being affordable, they vary in size and color. They are majorly responsive on diverse browsers and mobile devices making them perfect for marketing your photos and video galleries. 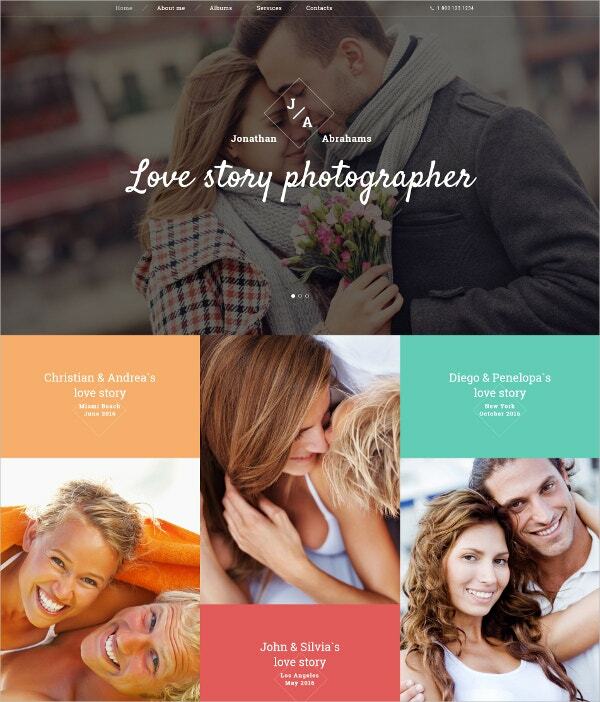 The Love Story Photographer Portfolio Website Template worth $75 is perfect for creative professionals including photographers, writers and artists. You can use it to create an appealing portfolio since it entails bold images, which enhance its background design. It is crafted in carousel slider with enhanced thumbnails, social sharing and drop-down features. The Oyster Portfolio WordPress Theme for albums and galleries is compatible with several browsers including Firefox and Chrome. It also works on WPML and Woo-Commerce 2.2× +version. It is effective on at least version 4.4.2 of WordPress. 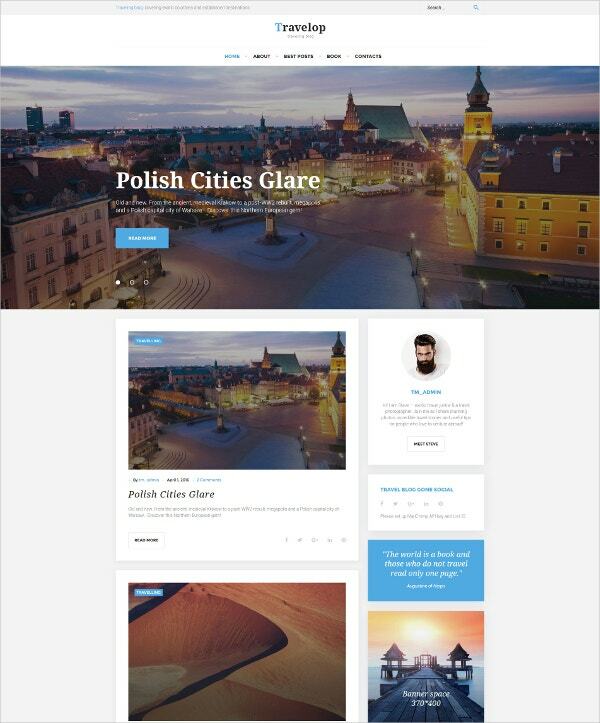 This well-documented theme of four columns has a responsive layout with PHP, CSS and JS files. 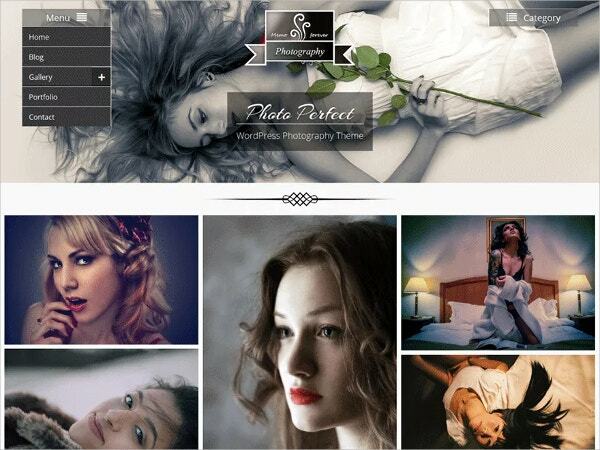 The Photographer Portfolio Responsive Moto CMS Website Template of version 3.0.21 of Moto CMS costs $199. It is worth the price since it contains vital widgets such as Google Maps, Menu, Presets Builder and Media Library. It functions on at least PHP 5.4.04. 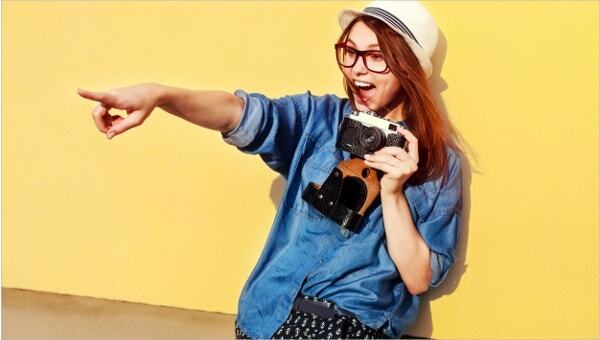 It serves effectively as portfolio for latest technology and photographers. The Photo-Architecture WordPress Website Theme costing $44 comes with regular licensing. It features high resolution and it is widget ready. It is compatible with browsers like Opera and Safari. It favors WordPress Version 4.6. 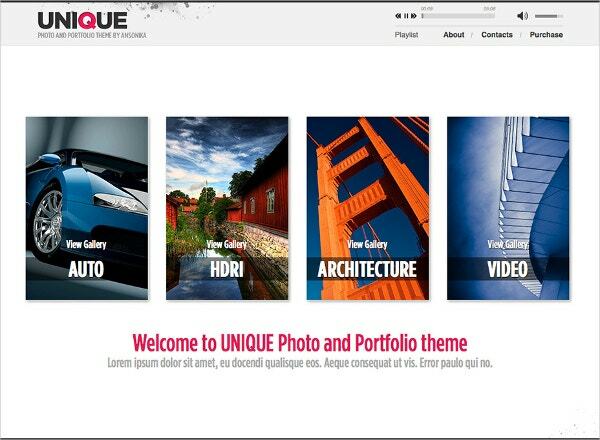 It contains layered PSD and PHP files in its two columns. Then, it is responsive and professionally documented. 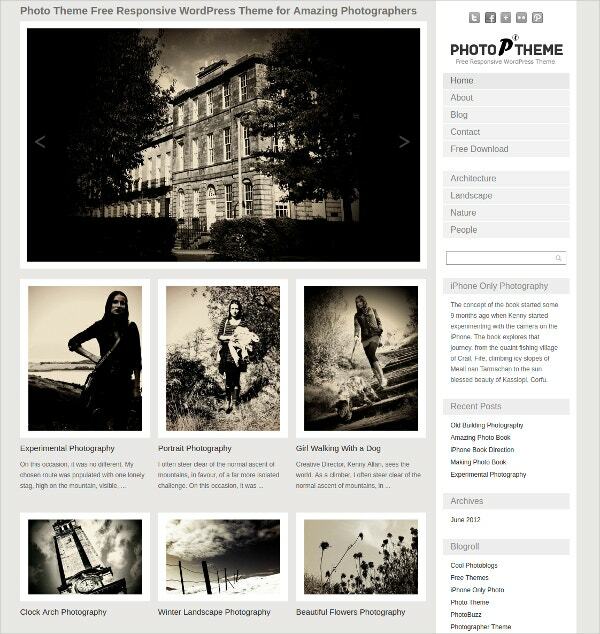 The Photo Studio Gallery WordPress Theme is responsive and sells at $199. It has been designed on Moto CMS of Version 3.0.21 and has widgets for the same including a menu and Google Maps. To host it, you require PHP 5.6+, Zend Guard-Loader or devices that support MySQL database. 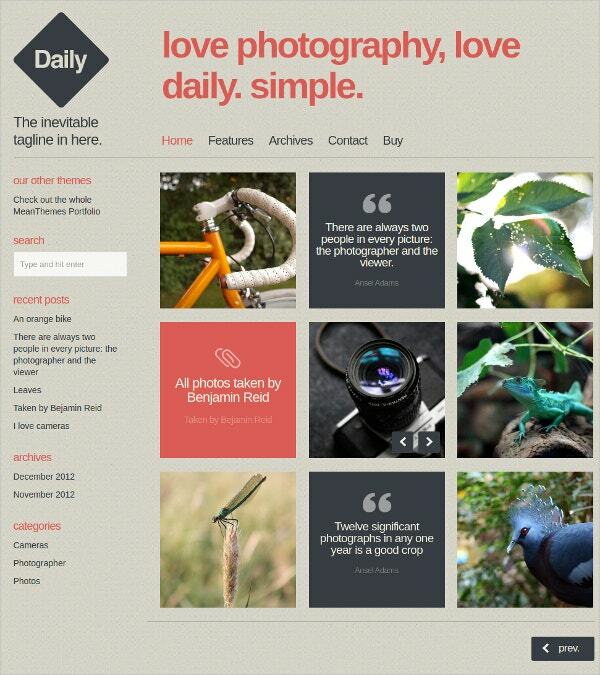 This beautifully designed WordPress Theme for Bloggers and Photographers gives photography a new look. You can get it in three unique models: Daily-Wide, Daily-Photo and Daily-Classic layouts. It supports posts of all formats ranging from audio to video, chats and quotes. Interestingly, it has unlimited color options and fonts that are editable. 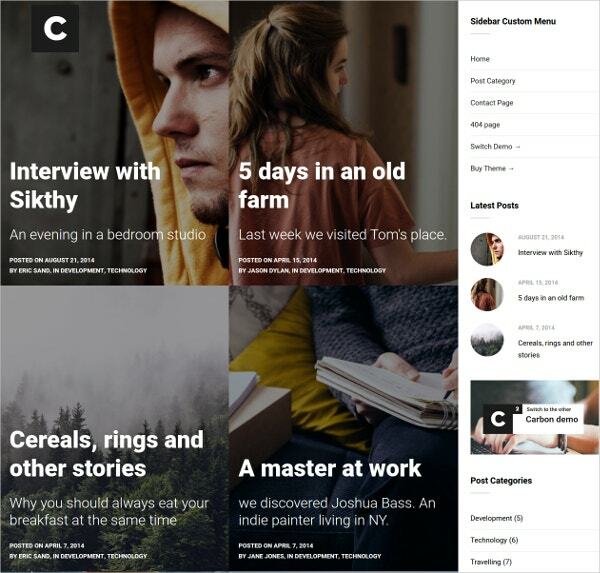 Carbon is an outstanding WordPress Theme for Blogs coming at $55. It is dependent on WordPress live customizer allowing you to edit and customize it to your needs. It has been perfectly coded for maximum performance. Then, you can choose among its 4 layout options and more than 600 Google Fonts. 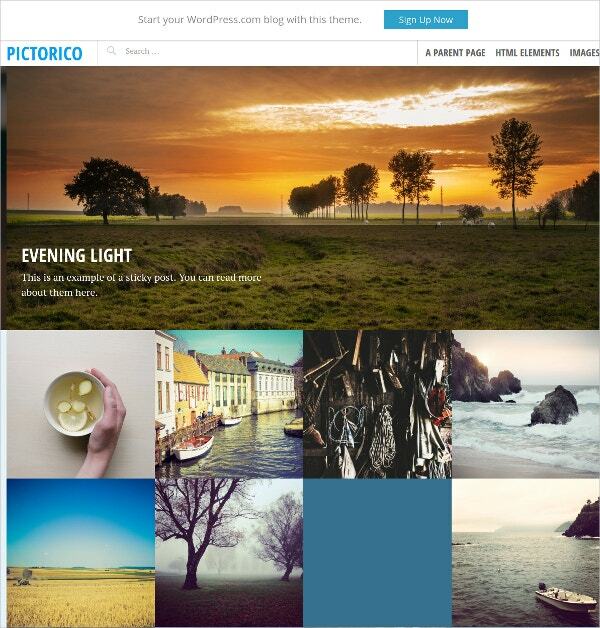 Photo Perfect is a Free WordPress Theme for professionals across different areas of specialization including Photography, blogging and artwork. This easy to use and customizable theme is responsive. You can use it to make your brand stronger online. It features footer widgets, images, custom menu and backgrounds, two columns and it is nigh for translation. 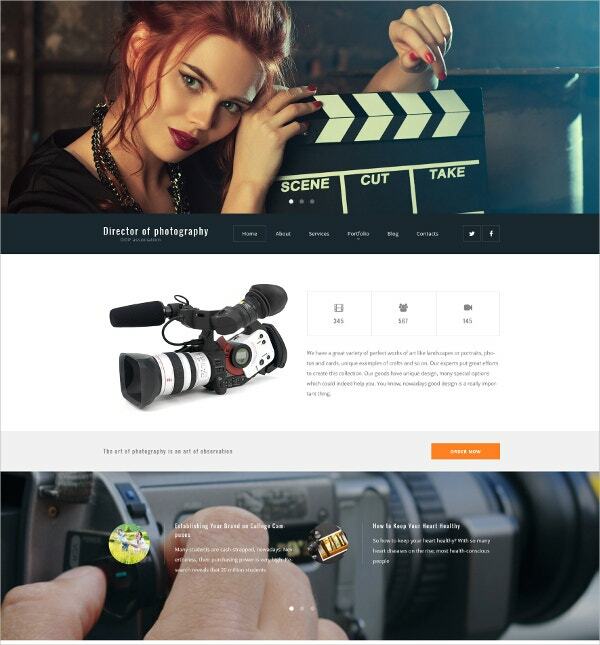 Director of Photography WordPress Theme allows bloggers to come up with elegant portfolios online. It has been improved with Bootstrap options. It operates across browsers and it is completely responsive. Its variety of slider plugins, transition effects, drag and drop editors and multi-lingual support make it unique and simplify its editing process. 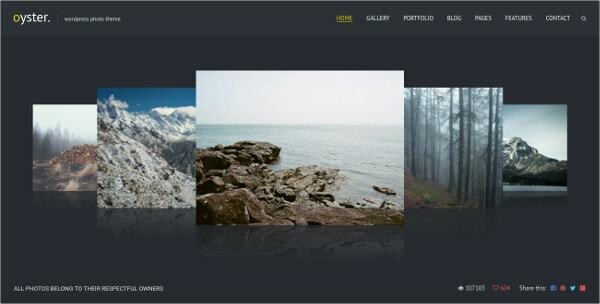 The Photo and Portfolio Modular Website Theme is colorful enough to cater for everybody’s unique needs. It is responsive featuring full-width slider and modular homepage making it right for business websites, portfolios, photography and creative tasks. It has layout shortcodes that are flexible and editable like its colors, columns and fonts. 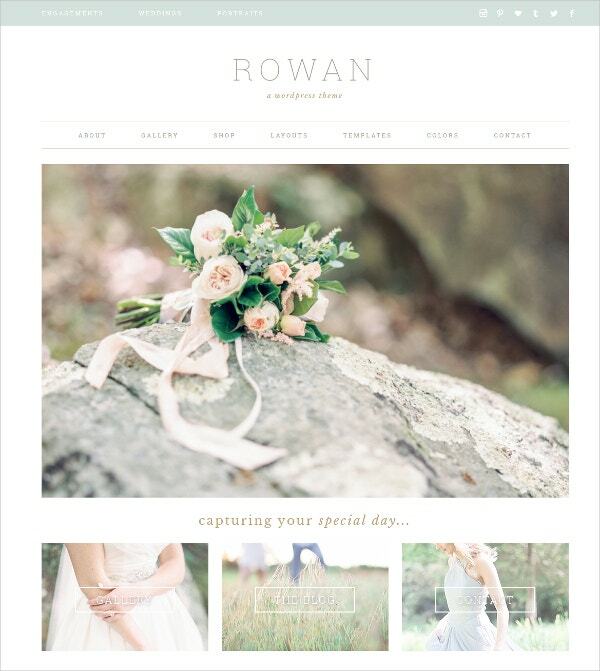 Rowan Feminine WordPress Theme at least requires HTML5. Apart from being SEO optimized, it is fully responsive on mobiles. It features configuration options, 12 icons for social media, Navigation menu and plugins for Woo-Commerce, Ninja and e-News and post share icons. It contains four-color schemes and three-page layouts. Travelop Traveller Responsive Theme for Travellers is professionally integrated with major social networking platforms including Instagram and Twitter. It allows you to customize your gallery, images, videos, quotes and audio formats. You can also adjust its layout with respect to sidebars, footers and headers using a single demo button click. This unique Photo and Portfolio theme that comes with an audio player can be downloaded after purchase at $14 only. You are guaranteed of full-time support and tips for perfect customization and editing. It is lightweight and consistent on al browsers. It also has an image viewer, rollover thumbnails and PSD files. 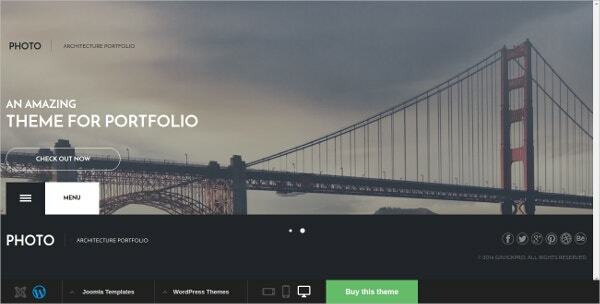 The amiable A WP website theme for blogs supports ZIP and all files. Its responsive layout contains two columns. It performs on Opera 12+, Safari 5.1+, Chrome 19+, Firefox 14+ and IE8+. It allows bloggers to display their videos and images on their blogs. It is also retina ready. 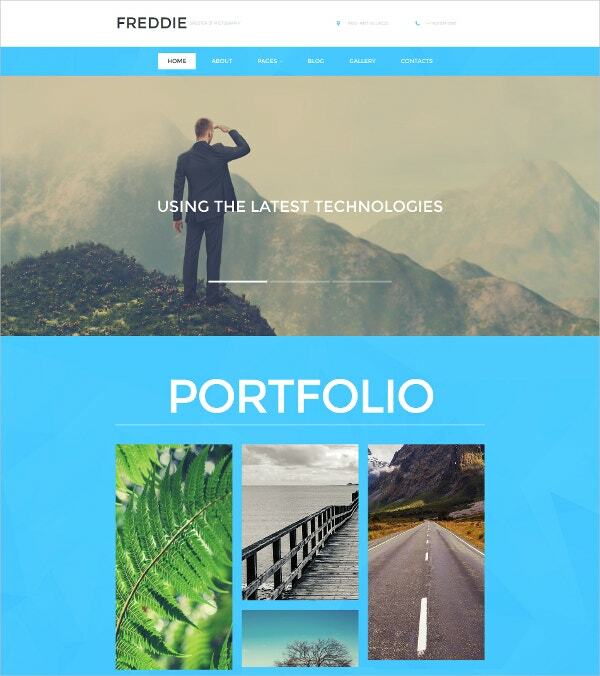 This website theme offers simplistic yet creative solutions to your portfolio. 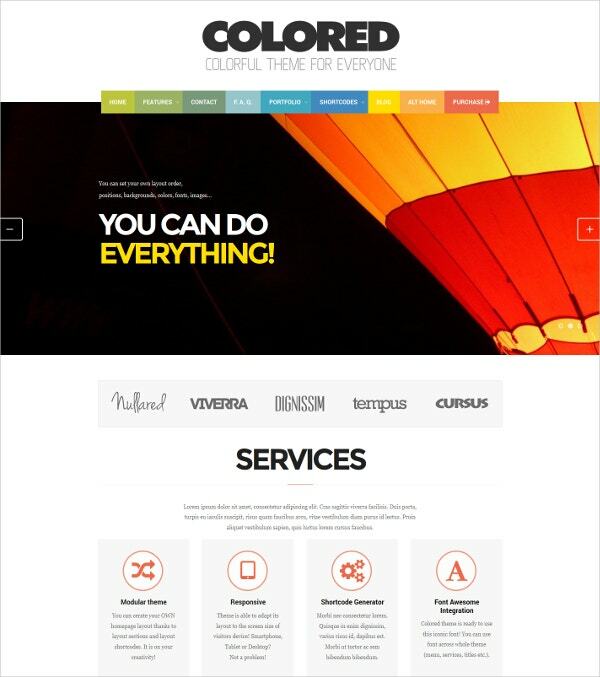 It features appealing typography, unlimited options of colors, solid documentation and ideal short-codes. It entails both light and dark skins along with sharing options on social sites. It also gives you the benefit of selecting from more than 600 Google Fonts. 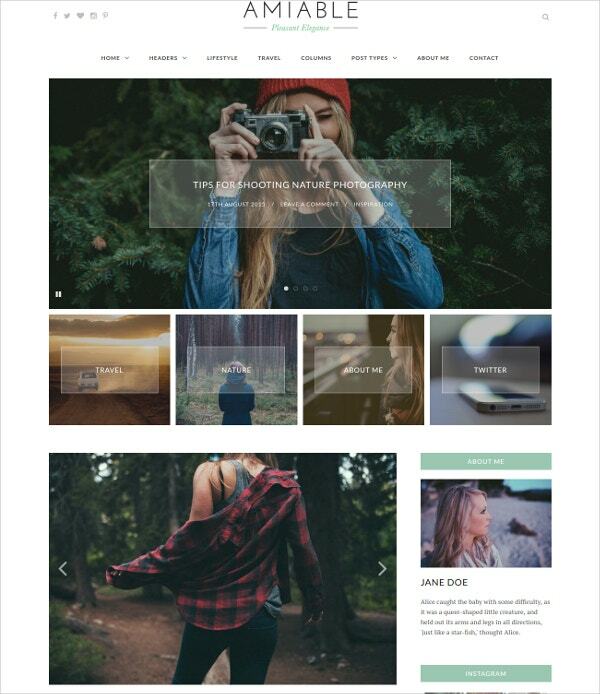 This single columned and grid-based WordPress Theme is supreme for portfolio sites as well as photo blogging. It entails a post slider that allows you to customize your identity, images of at least 1180px and content. It has four widget regions, a custom menu in its primary menu, background and custom header. 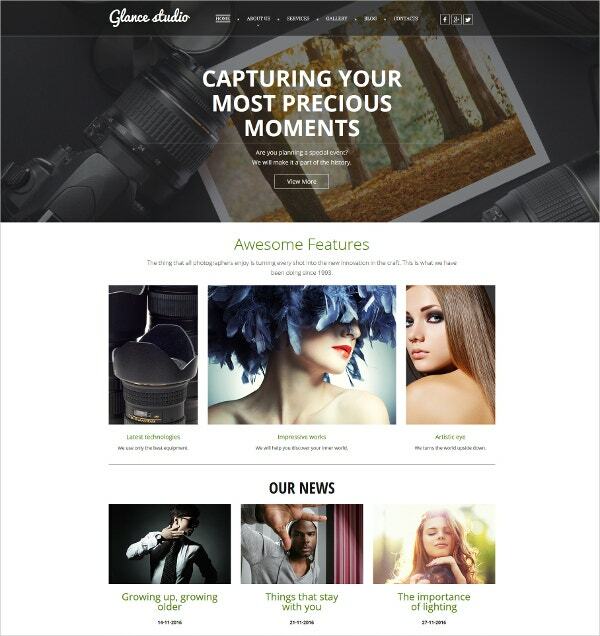 The professional WordPress Theme that is responsive with Tablets and Mobile is what photographers require. It features menus, simple grids, illustrations, creator and Press. It is compatible with Safari, Firefox and IE9+ Browsers. It also provides updates and support to users who can edit and customize it using XHTML and CSS. 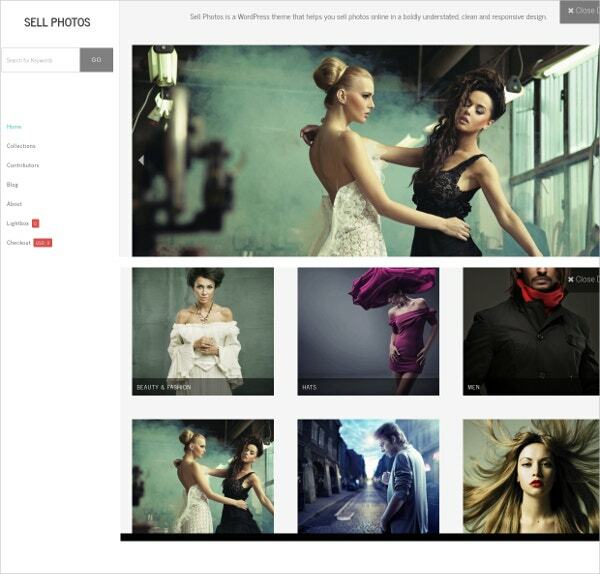 This theme allows you to sell your images and prints online on a furnished and responsive platform. You can easily customize logos, favicons, texts and headers. It also has room for slideshows, many file formats, unlimited galleries, automatic updates and widget areas. It also offers translation and accessibility at no extra cost. Finally, any photographer who wants to add style, flavor and personality to their site should purpose to use Photography Website Templates. They allow you to highlight your works to interested customers. The benefits accruing from translations, slideshows, diverse widgets and perfect resolutions cannot be underestimated; simply download and customize your themes to your satisfaction.